of hard work and dedication at a young age. After attending Kent State University and graduating with honors, he started his professional acting career. 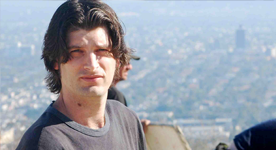 In 2002, after the tragic death of his only brother Justin, Ryan pulled his life and family back together, and was inspired to make his first feature film. He formed Just in Time Films with his cousin Jason L. Holloway, a six year Naval Officer who has served two tours of duty in the Persian Gulf. In 2007, Ryan wrote his script, trim. He spent the next year and a half casting, rehearsing, crewing up, shooting a promotional trailer and raising money for the project that was inspired by some of his own experiences in Los Angeles. He is now working tirelessly with a truly great team beside him to deliver trim to its growing audience. Ryan is also currently in pre-production on his next exciting feature film, wangthang. After graduating from The New Actors Workshop Conservatory in New York City, Britt went on to act in numerous feature films, network television shows and national commercial campaigns. In 2005, Britt transitioned into producing feature films. His most recent projects, along with trim, include FROM THE SHADOWS, CATHEDRAL CANYON and ROCK BARNES: THE EMPEROR IN YOU. In 2009, Britt also co-created and starred in the hit internet web series BURNING HOLLYWOOD (www.burninghollywood.tv) which garnered the attention of Good Morning America as well as Drew Carey´s company, International Mammoth and is now being adapted into a television pilot. Britt is also in pre-production on his next collaboration with Ryan, wangthang. Born in the beautiful city of Annecy, in the French Alps, Aymeric has lived in France, Hong Kong, Japan, and Los Angeles. His extensive travel experience and multi-cultural upbringing equipped him with a keen visual sense. It was in L.A. that he got a Bachelors degree in Theatre and another in International Business. He then received an MBA in Media, and an MFA in Film Production, during which he acquired essential cinematography skills. He has been refining those skills ever since, working as a cinematographer in all film and digital formats, on projects featuring talent like Academy Award winner Billy Bob Thornton, Ed O´Neill, Golden Globe and Emmy winner Ed Asner, and Academy Award nominee Bruce Dern. Scott is an award-winning editor who has honed his editing skills for the past decade working on many indie and studio level projects. Scott´s multi-faceted skill set led him to not only editing trim, but also having a major hand in it´s distinct color correction and doing all of our special EFX. His impressive well roundedness and dedication has made him an invaluable part of our team. Scott is currently working on two other soon to be released feature films and recently secured a distribution deal for his own feature film, FROM THE SHADOWS.